Time is one of our great limitations as we are a very small operation. Ruth and Kay have been spending a great deal of time caring for the children at Rolling Hills Residence, organizing the food distributions to the community, distributing goats and uniforms and clothing, and offering ongoing support to Exodus Children’s Home, run by our great friend Elijah. The past months have also seen a great deal of time devoted to expanding our sponsorship program (from 17 children in September to 48 as of this writing), providing the wish lists of children to allow them to go to school and have basic needs met, developing the Christena Gay Library (the first of its kind in the whole district), and in developing the Toor Education Centre. We have continued to gather money raised by schools across North America and are ‘pooling’ this money for ongoing projects – including the need for an expanded facility to provide a home to more children. I wish we could provide more direct feedback to schools right now – exactly how we are using your money – but right now we’re not using the money as much as holding onto it, waiting to use it the right way for the right project. Please, please, please, be patient with us and keep reading the updates. Transparency is important to us, letting you see exactly how your money was used is our moral obligation to you, but we want to make sure we use the money wisely and not just quickly. One of the newest changes will be an administrative one. Starting in April Kay will be in charge of almost all aspects of the sponsorship program. She had been running things in Kikima and I’ll be offering some assistance from this side of the world. She’ll be doing all the work, all the communications, and all the identification from Kenya. Thanks so much for following our project, but more importantly, thanks for transforming lives! Highlands Secondary School under the direction of Crystal Dumitru has been engaged in a variety of activities to raise funds. These have included a Diversity Luncheon, a ‘Day of Silence’ by more than 200 students, a cafe, creating I-movies, a day without desks and a spare change challenge. While there will be a full report – and pictures of these activities in the April update – we are excited to announce that they have raised over $5200! The Creation of Hope is a foundation where people who are able to have meals everyday, shelter, clothing, education and more, donate to others who barely have any of those. Our school has done our part by having two candygram/cupcake sales and a week long coin drive. Mrs. Abu-Hejleh, who is a parent at the school, helped by baking different pastries to be sold to the teachers. Her contribution alone made over $50.00 towards the total donation. Overall we raised almost $1200.00. With these funds we fulfilled a wish list for one child, contributed to building a well for the residence and our last contribution will go towards building a new residence. Our school has done a great job in helping those in need. We will be having two more fundraisers before the end of the year. Further information will be forthcoming. Thank you to all who donated. The great work at Fairview is the product of teachers, like Lorin and Lorraine, supportive administration, Stephen Webb, Principal, and Laila Culbert, Vice-Principal, wonderful parents such as Mrs. Abu-Hejleh, and of course, great students! 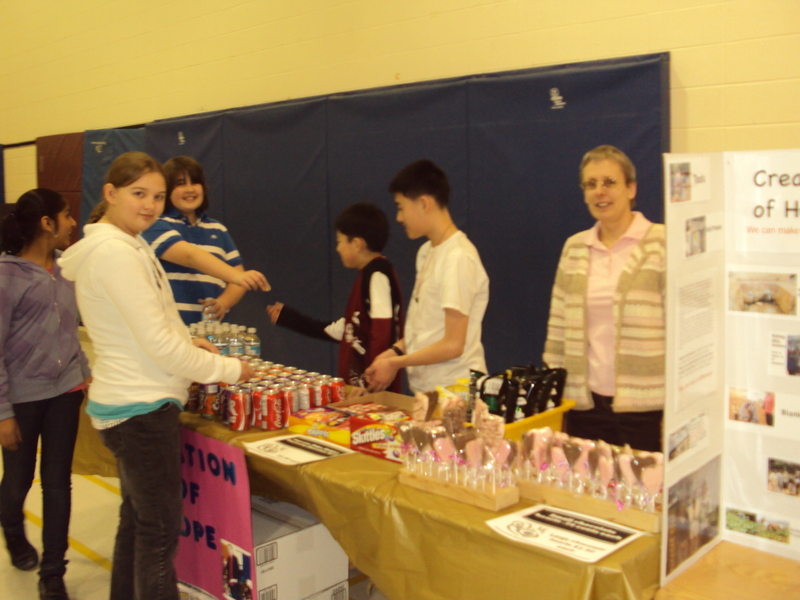 Alexander Graham Bell – raised $274.00 at the snack bar at the Valentine’s Day Dance! Here’s a picture of students, and teacher/librarian Barb Kettle, the driving force behind AGB’s efforts! 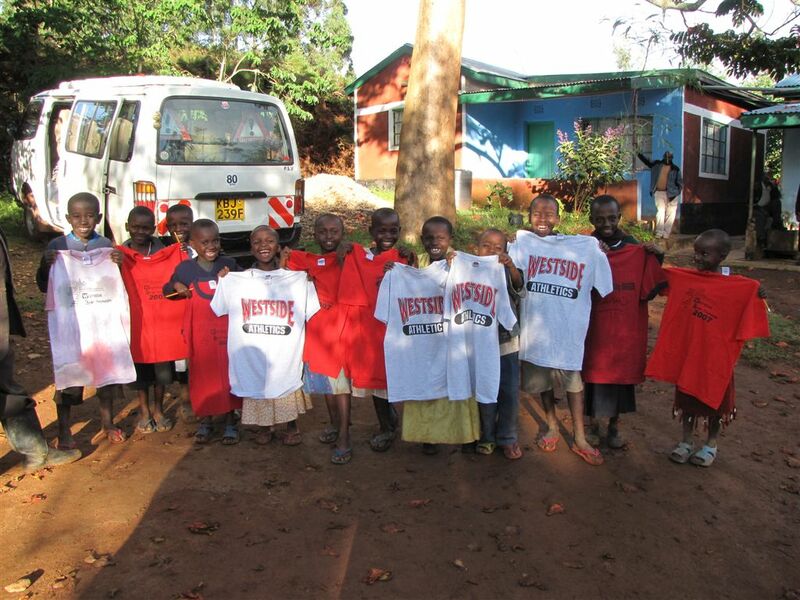 Local Kenyans continue to rise up to help the children in the Creation of Hope project. Below are two letters from Kay outlining two of these generous donations to the children in the Rolling Hills residence and Exodus Children’s Home. 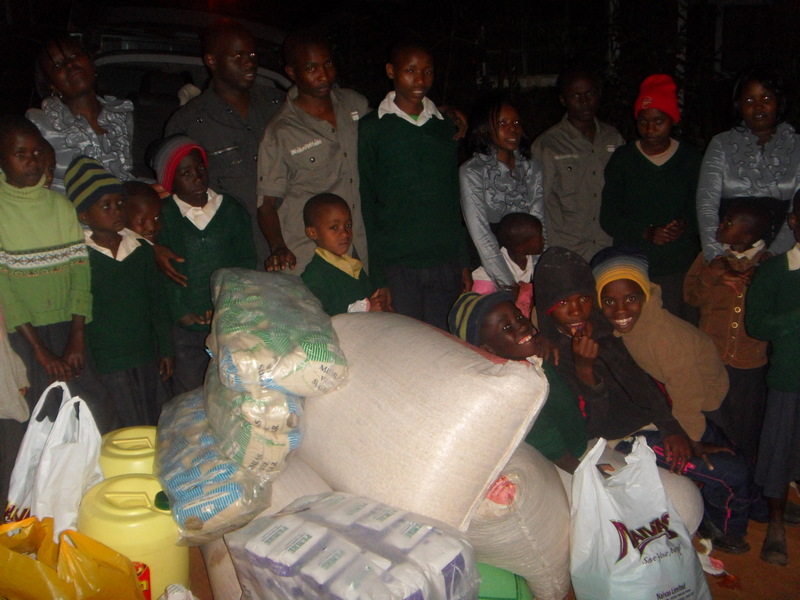 I had previously talked to my co-sponsor about Elijah and what he is doing and he said that he’d like to do something for him and on Saturday, we travelled to Exodus Children’s Home to deliver a whopping Ksh.16,131 worth of food and personal effects!!!!! If we had sponsor of the year, I would definitely nominate Ngao Mang’ati for the award. 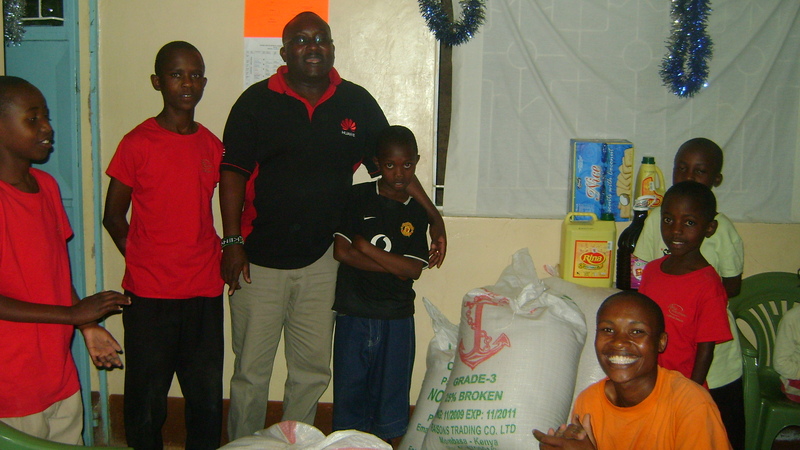 His friend and colleague Dominic Mwinzi, donated 90kgs of maize flour when he heard we were planning to go to Exodus. Mom donated 12 packets of sanitary pads for the girls and I donated 6 litres cooking oil, 5 litres Juice and 1 box of biscuits. 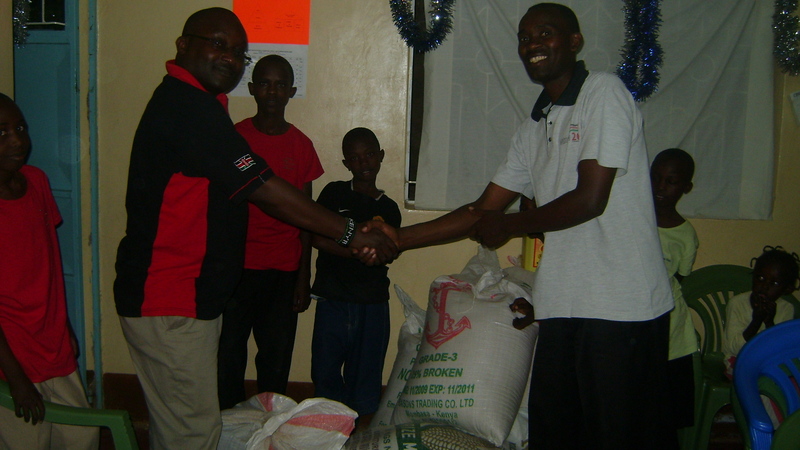 Ngao Mang’ati gave an incredible donation of 90 kgs of Maize, 45 kgs of beans and 100 kgs of Rice! We had to hire a taxi from Machakos town to delivery all these things. We drank juice and ate biscuits with them .For some reason, Elijah was impressed that we could actually get our hands ‘dirty’ and commented that it was a great example for the kids) and we even danced with them! It’s amazing the impact that such a gesture on our part can have on someone else. The joy on the children’s faces was worth every cent. They were so overwhelmed that they did not wish for us to leave and we ended up leaving at 10pm! This, Eric, is a sign of what people can do, when they are committed to helping the less fortunate. Ngao, thank you again, for giving these wonderful children another reason to smile. It’s amazing how much people are coming out to help this project, which was started with no idea that it would grow to this. On the 5th of March, Kioko, accompanied by 9 people from a clearing and forwarding company, Jaspa Logistics, drove into the compound in Mbooni at around 7pm, with the trunks of the cars sagging. We had no idea what was in them, and even after they off loaded, we could hardly believe that all this food was from there. It always gladdens my heart when I see Kenyans coming out to help their fellow Kenyans, and that’s not saying I don’t appreciate what you are doing any less. Ann Wambua (the lady handing over the bottle of Juice), organized the trip with Kioko, and their Boss, Alice Kitavi (being thanked by Mr. Kiio) generously provided her two cars (and also gave them the day off) so that they could come and visit us. The time we spent with them was short but they will be remembered for a long time to come. They interacted with the children (and even one lady left me with Ksh. 200 to buy Faith a pair of slippers), taught them a few dance moves (don’t worry Eric, they were better than Kioko’s moves), joked and played with them. As they were leaving (I found Ricky seated comfortably in one of the cars ready to go off with them! ), they promised to come back for a whole day, they enjoyed the visit that much. There is nothing we can give them in return, except our sincere thanks for such overwhelming kindness. We’ve just had a donor come forward with a donation of $1500.00 to be directed toward water projects – we love water projects. You give people water, you give them life. In the months to come we’ll be telling you more about these projects and the person providing the drive behind them. $100.00 donation by Ursula Balas – she is Marina Cohen’s Aunt and was told about the program by Marina. Fred Dawber has once again opened his heart to another young person in Kenya. 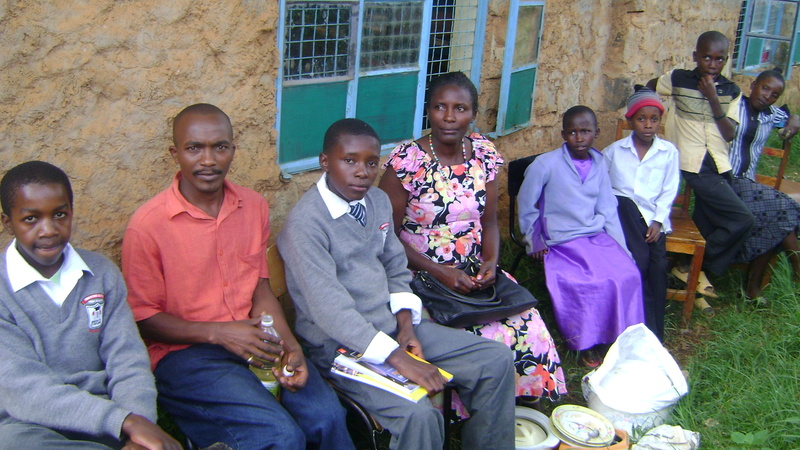 He has provided sponsorship for this young man to go to high school, something that was within his grasp intellectually but outside of the financial abilities of his family. This is one capable young man given a chance to become somebody special by the special generosity of Fred paying his school fees. The pictures of these T-shirts are going to be part of an event to be held in Orangeville in Westdale Secondary School. Exodus Children’s Centre is in a rented facility. Last year LaSalle Public School donated money to pay the rent for one year for these children. Some of this money was ‘back rent’ which was overdue. Starting in January they needed to have more rent. $1000.00, to pay for the rent from January – July 1 was provided by two schools – $624.00 from Cupar School and $376.00 from Robert Southey School. The orphans of Exodus continue to have the stability of a roof over their heads through the kindness of the students of these two schools. This accounts for all funds raised by Cupar and leaves an additional $433.00 from Southey still to be spent. Special thanks to Mike Berg who coordinated all the fund raising efforts in Saskatchewan. The nineteen children listed on the ‘needing to be sponsored’ section have all had their wish lists granted and pictures are being sent back to the person responsible for the list being fulfilled. The matron’s salary of $100.00 for March was provided by the students of Medicine Hat High School. This is our matron, surrounded by her children and nephews and nieces – all are supported through her salary. Through your generous contributions we have made additional payments to pay for her children’s school fees. This has included funds from Aldergrove P.S. 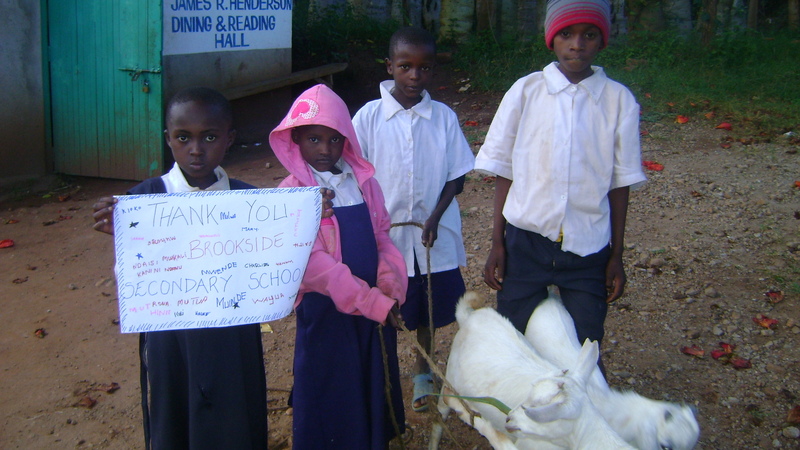 Goats were purchased with funds raised by Brookside and given out in March. Anastasia’s mother died and left her and her younger sister behind to be raised by their grandmother. She was born in 1993 and is in standard (grade) 7. She received a uniform from The Creation of Hope. In her last exam, she was position 29 out of 42 students in her class. 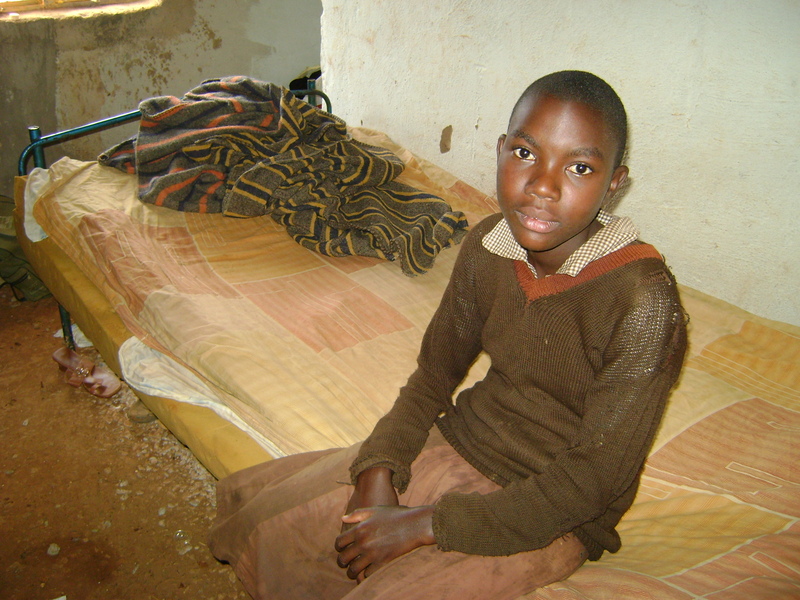 Her 11 year old sister, Wayua Nduku, lives at the Hope Home – Rolling Hills Residence. The grandmother burns charcoal for sale, with the help of her grandchild. 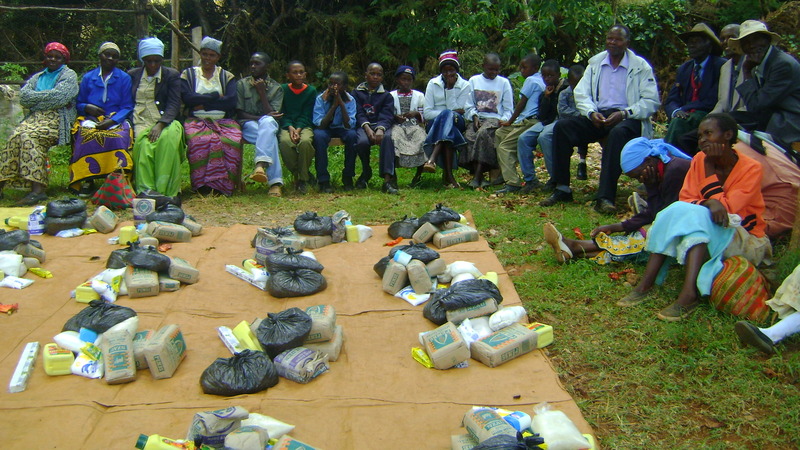 The farm produce is low due to inadequate rainfall and the government relief food is insufficient for their needs (between 1-3kgs of maize per month). When they do have surplus harvest, she sells it to get some money for their needs. She has planted maize, beans, cowpeas, green peas and black beans. She had 3 cows, 7 goats and 10 hens but these were killed by the recent drought and famine. Anastasia sleeps on a wooden bed with rubber straps for supporting her mattress. She has only 1 blanket to cover herself with. Her wish list includes textbooks, stationery, clothes, beddings, school administration fees, examination fees and PTA (Parents Teachers Association) fees, and was also covered by a donation of $95.00 by Kate. Kate has returned to Canada but her heart remains in Kenya with her ongoing caring and support. Doureen’s exact age isn’t known. She was born in 2000 and lost her mother 5 years later. Her father is also dead and is buried in Mombasa. She has a brother who did his standard (grade) 8 exam in 2008. She is in was position 8 out of 27 in her class. On the 81 year old grandmother’s 1 acre of land, they plant maize, beans and peas. They have 1 cow, 1 calf and 2 chickens. The grandmother earns an income from selling farm produce and chickens. Their house is made of brick and iron sheets. Doureen sleeps on a wooden bed with her grandmother. They have 1 blanket, 1 sheet and a mattress. Mwendwa – Sponsored by Nina, Paul, Jamie and Liam. Mwendwa Mutiso was born in 1994 and is in standard (grade) 7. In his last exam, he was number 13 out of 41 students in his class. At the time we first met him in January 2009, he was living with his elderly grandmother and four other siblings. She has subsequently passed away. His eldest sister, Elizabeth Nduku, went up to standard 8 (2004), and now runs the home. The second born, Janet Ndunge went up to standard (grade) 8 and then went to do a tailoring course in 2008 at a local polytechnic. When she couldn’t get work in her profession, she moved to Nairobi to work as a househelp (live-in maid). 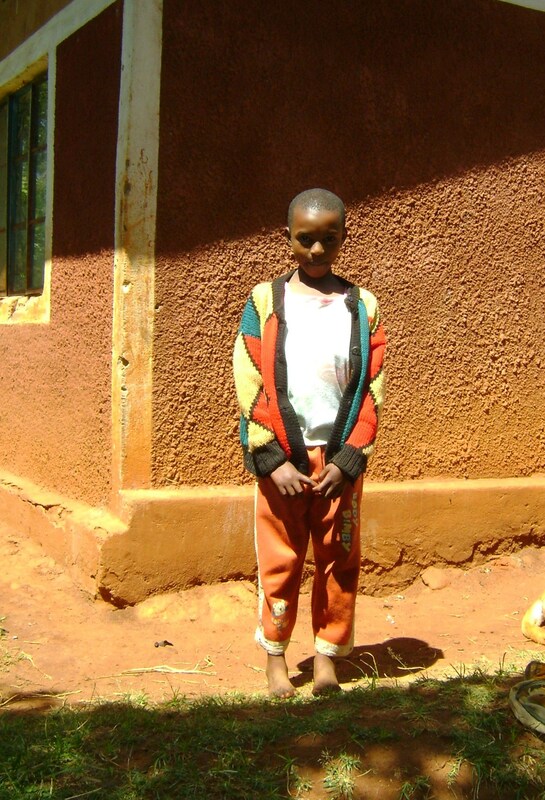 Catherine Mueni, the third born, gave birth to a child in August 2009 and went to live with the father of the child, even though he could barely provide for himself. 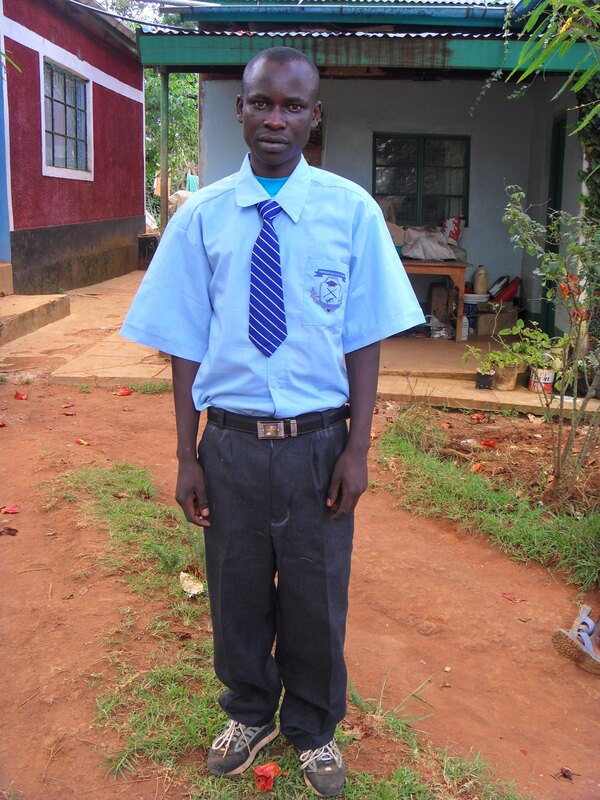 His other older brother, Joseph Muoki has done his standard 8 exams and the final sibling, Mercy, is in standard 7, and now lives at the Hope Home – Rolling Hills Residence. They have a ½ acre plot of land on which they plant maize, bananas, sugarcane and arrowroots. They also have 14 chickens. This is their only source of livelihood, apart from the meagre government relief food and neighbourly assistance. He shares a bed with his brother. It’s made of wood and has sisal straps to support the mattress which consists of clothes and they use a sheet to cover themselves at night, scarcely enough to keep away the cold. Naomi – Sponsored by Mr. Rumsby and his class! Naomi was born on 16th April, 1996. Her parents died from HIV/AIDS in 1999. Ezekiel, a distant uncle, took her into his house in 2005. He is married with four children of his own, Ndunge Mawia (standard 6), Samuel Mawia (standard 2) and twins Nduku and Mumbua Mawia (1 year old). Neither he nor his wife has formal employment but they do casual hard labour to earn an income and receive some additional financial support from Ezekiel’s father, a pastor. On their 1.2 acre land, they plant maize, beans, peas, cow peas and millet. They have just 1 chicken and 2 donkeys. Naomi is currently in standard (grade) 6. 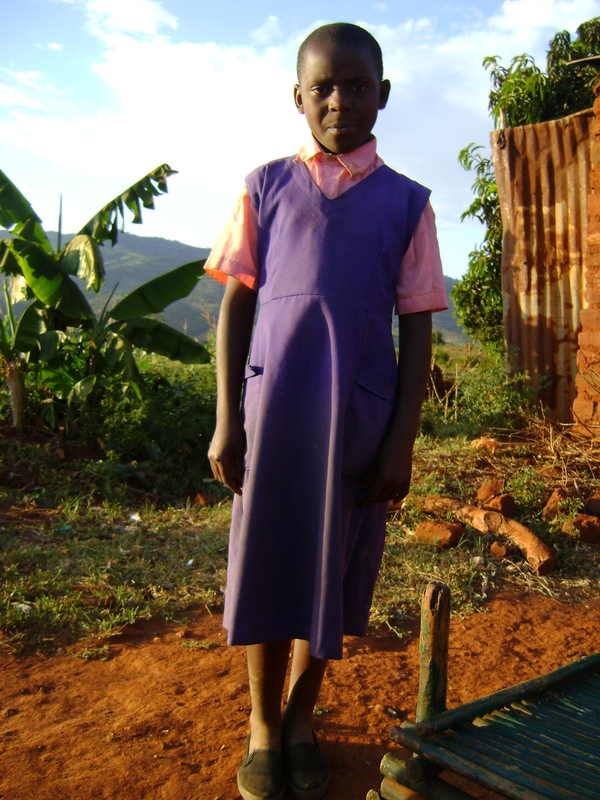 She recently received a new school uniform from our program. 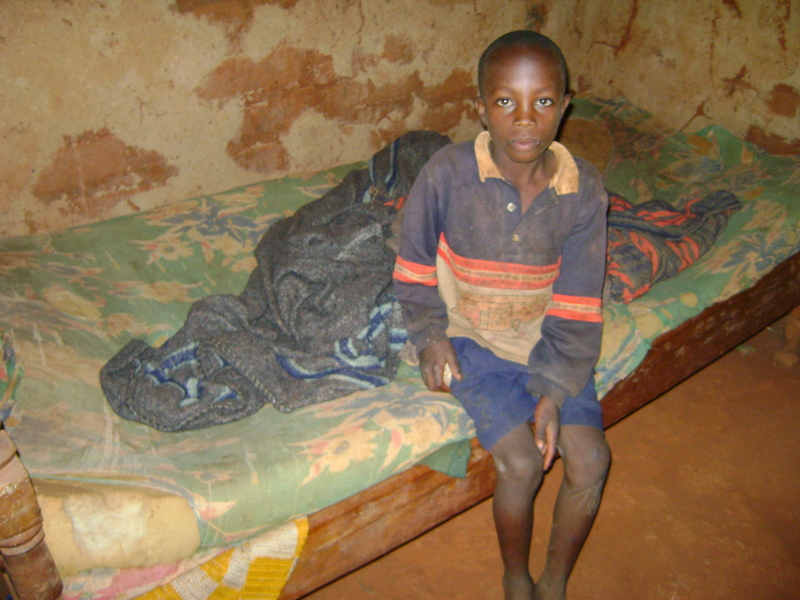 She shares a bed with her cousin and suffers from recurrent malaria. Minoo was born on April 1st, 1999. She is in standard (grade) 4 and in her last exams, she was position 10 in her class. She lives with her elderly grandparents, two siblings and two cousins. On their ¾ acre piece of land, they grow coffee, kales and bananas. They have 1 cow, 2 chickens and 7 goats. Between the two of them, the guardians make an average of $33.33 per month from selling kales and coffee. Minoo shares her bed with her sister and cousin, they have a mattress, a sheet and blankets. Wambua is sponsored by Ken Chege. 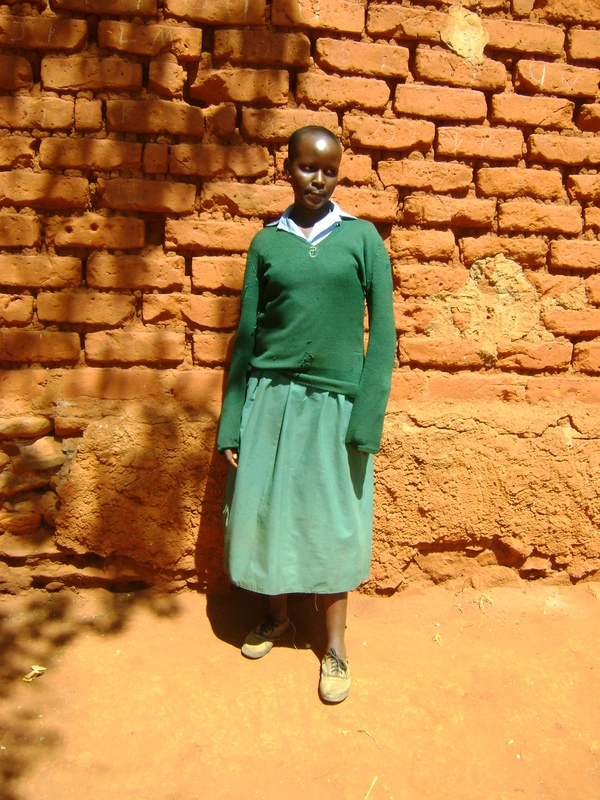 Wambua was born in 1997 and is in standard (grade) 6. He received a new uniform from our program. He lives with his elderly grandparents and brother who is in standard (grade) 5. In his last exam, he was position 16 out of 72 students in his class. He shares a bed with his brother and they have only a blanket to cover themselves. He had a cleft lip repair operation in 2004 and has recovered well. 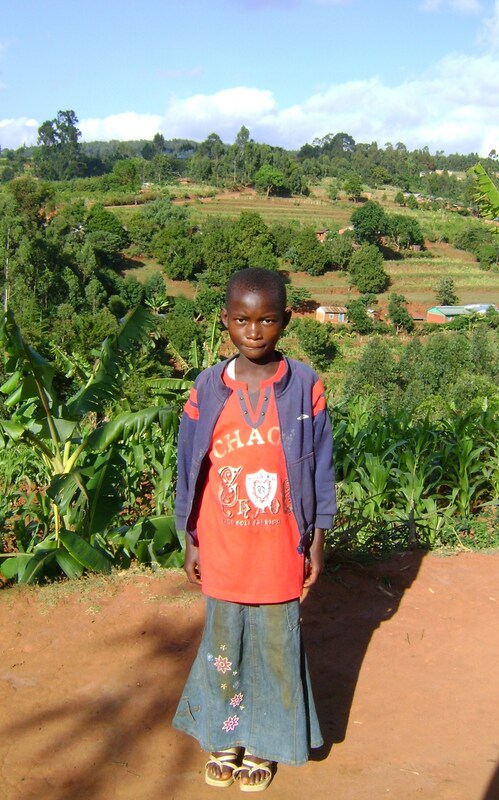 His grandparents have 11 goats and on their 1 ½ acre land, they grow maize and beans. They earn a meagre income from casual labour in other peoples’ farms. When things become financially tight for them, they were forced to sell a part of their land. 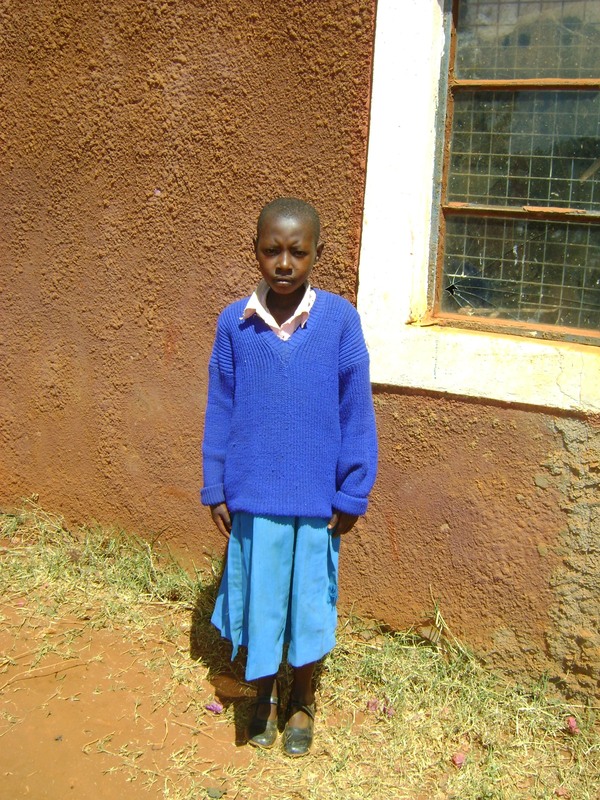 Wambua’s wish list consists of books and stationery, shoes, clothes, towel, beddings, mattress, and PTA (Parents Teachers Association) fees, which could be provided for $105.00 – paid for by the donation of Martin Swist, a teacher/librarian at the American School In Japan. Narcaster – Diana Krawczyk provided sponsorship and also gave extra money for her wish list. Narcaster was born in 1997 and is in standard (grade) 5. She and her sister and brother live with their uncle and aunt. The siblings all share the same bed. It is made of wood and rubber straps to support the sisal mattress they use and have only 3 bed sheets to cover themselves. The ½ acre of land is planted with maize and beans. They have 1 cow and 4 hens. The guardians are not formally employed but rather, earn a meagre income from casual labour wherever and whenever they can get it. Residence: In community with her 43 year old uncle. Yula was born in 1998 and is in standard (grade) 5. She and her 15 year old brother live with her uncle and aunt and their two children. On the ¼ acre piece of land surrounding their home is planted with coffee, maize and beans. They also have 1 cow, 2 goats and 4 chickens. The uncle is a teacher. They live in a brick house and Yula shares a bed with her cousin. 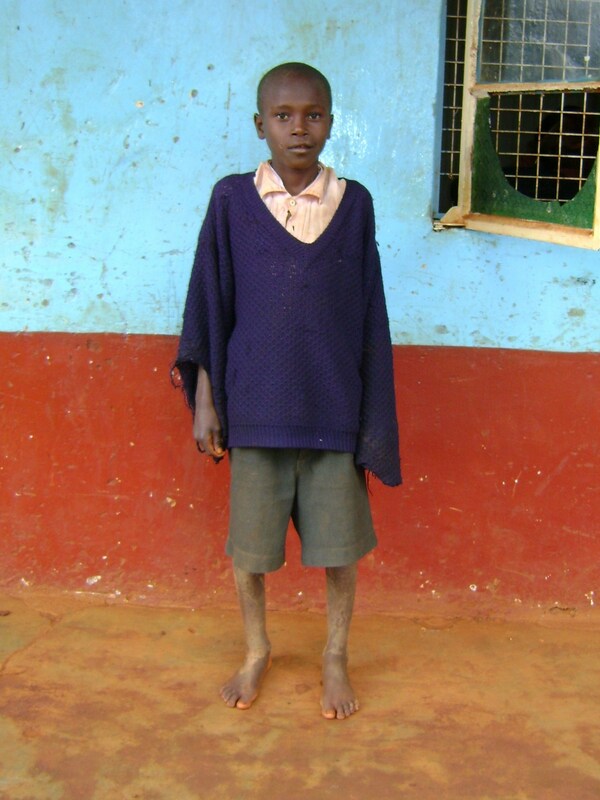 Mutua is being sponsored by Teresa Gawman who also provided funds for his wish list. 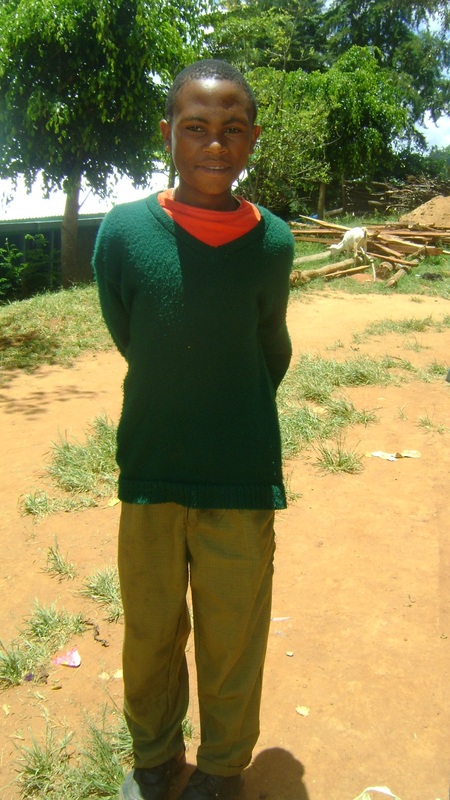 Mutua is 11 years old and in standard (grade) 4. He has two brothers, one in standard (grade) 7 and the other in standard (grade) 4 and a sister in standard (grade) 6. They live with their elderly grandparents and two cousins. On the 1 acre land, they plant maize, beans, bananas, cassava, avocadoes and mangoes. They have 1 cow, 1 calf, 3 goats, 3 kids and 12 chickens. The grandparents earn about $50 per month from selling milk and other farm produce. Mutua shares a bed with his two brothers. They have a mattress and 3 blankets. 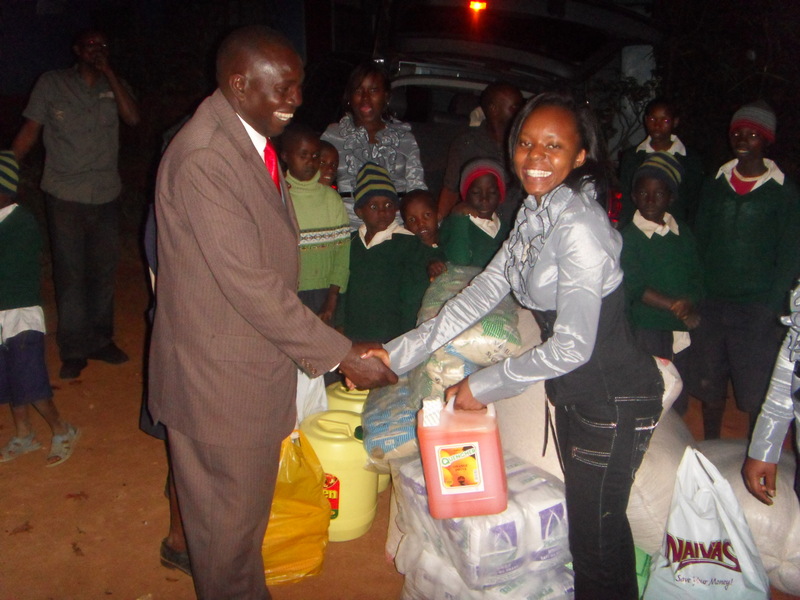 His wish list included textbooks, stationery, a school bag, clothes, uniform and school shoes and socks. All of these items could be provided by a $72.00 donation and has now been granted.